Who doesn’t love a biometric security measure? Whether it’s a thumbprint on your iPhone or facial recognition software, having your technology and personal devices quickly and conveniently authorize you in a split second is pretty darn cool. Not only does it make moving through your day just a little bit easier, it also has that futuristic quality we all suspect is somewhere on the technological horizon. But the truth is, biometric security technology is actually a fairly mature product—we have just been relatively sluggish in our adoption of its features. But anyone who’s had a retinal scan in the airport, and consequently skipped the entire line of irritable travelers waiting to get through security, will tell you, we should have been doing this a long time ago. Fingerprints: Yeah, nothing special here—the smartphone thumbprint is old school by now. Hand geometry: The use of hand shape, including size and dimension, to identify a user. Retina and iris scanning: This “ocular-based” process uses the physiological characteristics of the human eye to identify someone. Capillary mapping: Now we are talking futuristic—this technology images the cuticle on a human finger by using microangiography, or radiography of small blood or lymphatic vessels of an organ for the layperson. Although this solution is still in clinical trials, it is being implemented to treat and diagnose various diseases, such as diabetes, and will likely be coming to the security world soon. Voice and speech recognition: Also known as voiceprint, this form of authentication uses a microphone to measure the unique biological factors that comprise the human voice and speech patterns. As technological solutions to real security problems, these measures are both cost-effective and entirely adaptable. Experts say the average computer user cannot remember their own passwords at least 30% of the time, which translates into a lot of wasted day sorting out authentication steps, text codes, and IT support. Where is my phone? Biometrics removes all this trouble, all this headache, and ensures people get the access they need when they need it. Further, passwords, ID cards, fobs, and all those traditional identifiers can be lost or stolen pretty easily—but everyone knows there’s no way to misplace your eye or your finger; it’s always there. If you’re up on your technology news, you’ve probably heard that some companies are now starting to use biometric chips, or “transponders,” to identify their employees. 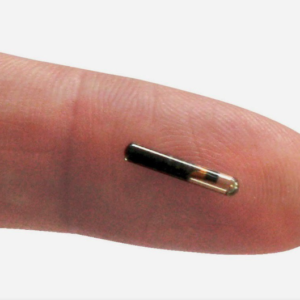 Actually, an estimated 75,000 people have now been injected with a microchip implant in the subdermal fascia between their thumbs and forefinger. Not intended to track employees, rather companies are currently adopting the measure to empower their people to move around their work environment with complete confidence and authority. The cylinder-shaped implants contain a super-tiny microchip made from a bio-safe epoxy resin and a copper antenna wire coil encased in a lead-free borosilicate glass or some kind of body-compatible glass. They can be placed in any kind of animal and are field powered, which means they don’t need a battery or a power source. 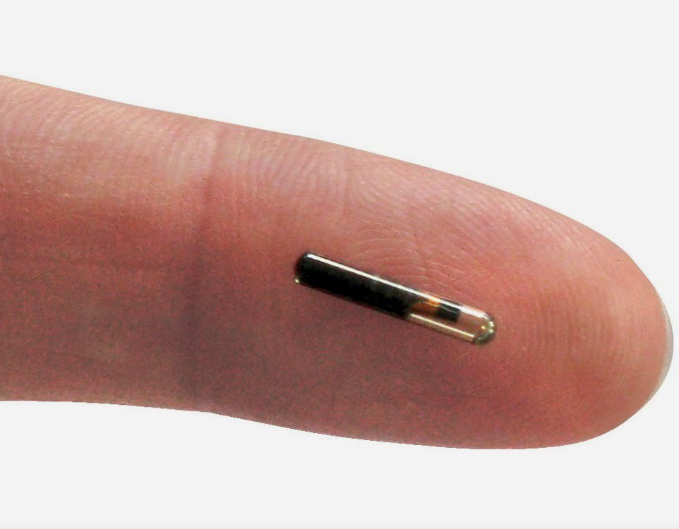 The chip itself lies inert under the skin until it comes within the field of the reader device, at which point the chip can communicate over a magnetic field. It only comes to life when it needs to be used—or that’s the idea anyway. These implants typically fall within a broad spectrum of radio frequencies and have programmable memory space and basic security features, which allow the user to program or clone them. The only real danger associated with these biometric chips is the threat of infection when people take the “do it yourself” approach. A proper aseptic procedure must be followed, otherwise users can develop a nasty staph infection or worse. When first placed in the skin, there will be a bit of mild swelling but no real pain—although there are some reports of itchiness around the site for months afterward. In general, the chip can’t be seen or felt and does not register on metal detectors or airport scanners. They are not permanent and are easy to remove. So, what not to like? Honestly, the pros outweigh the cons when it comes to microchips and biometrics in general. When handled safely, they can make data transmission and recognition simple and fast. Everything from identification to membership to health records to child abduction situations to criminal management to law enforcement and gun control are all vastly improved by this technology. But for those who view technology with a certain degree of suspicion and skepticism, using your body to identify yourself will never be free from “Big Brother-like” implications. Like any other data, the information generated by your body can be used for good—but in the wrong hands, it can also be abused.